For a small (and sold out), 2nd year run, this was phenomenal. The race was made for ultra runners. Packet pickup was a breeze, the volunteers were so encouraging and the aid stations were stocked! The scenery was worth the 5 hour drive. Absolutely stunning! From running behind waterfalls, alongside (and through) creeks, over rocks, along ridges with stunning views... Daniel Boone National Forest is on my list of places to visit again. The race finishes with a 1/4 mile stretch across a bridge and ended with a high-five from the race director. Sign up as soon as registration opens in the fall. Camping is close by and super inexpensive or snag a room at a nearby hotel. I did The Bear - the 5K then the 5 miler. In 2015 it was snowy. In 2016, warm (for February) and sunny. Either way, it was a blast to be out running with friends. The course was easy to navigate and offered a great tour of downtown. The new home at the CityWay YMCA is was fantastic - plenty of indoor space to keep warm and stretch out. Packet pickup was a breeze. And the after party was a ton of fun, complete with free craft beer! I can't believe I'm saying this, but I can't wait for next winter! It was incredible to see so many local runners out there chasing their first 5K or half marathon, going for a PR or coming together as families on the 1-mile fitness walk. The race is put on by Carmel Road Racing Group, the folks behind Carmel Marathon, Indy Women's Half and others, and it's clear that they know what they're doing. Course support was great, although it was easy to relax and forget you were part of a nearly-1,000 person event. The water stops were well-manned. The volunteers and spectators enthusiastic. The race crew very runner-focused. The course was well marked and accurate with my GPS. This is one that'll stay on my race calendar every year... especially since they announced 'streaker' awards! 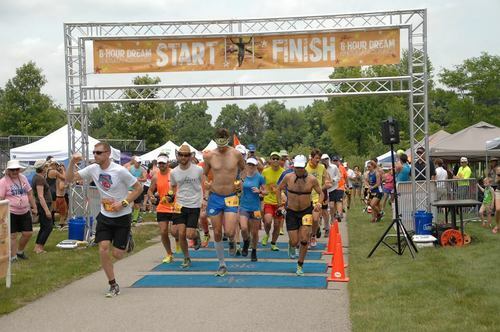 "No Other Race Like It in Central Indiana"
The idea of an ultramarathon can be intimidating, but this one makes it far more approachable. The Carmel Road Racing Group - the folks behind the Carmel Marathon, Indy Women's Half and others - created this race in 2015 and broke down so many barriers to the traditional ultra. The race had 2 course options and runners could jump between them to keep things fresh. Being on a looped course also meant that we got to pass through the runners village every few miles, grab supplies from our drop bags, eat, hang out with friends, leech of the energy of our friends and families and even freshen up with a garden hose. Oh, and did I mention real, flushing toilets!?! This race is low-key, well organized and rooted in having a good time. Tons of food and beer. Lots of support! Can't wait to see what kind of ground I can cover next year! 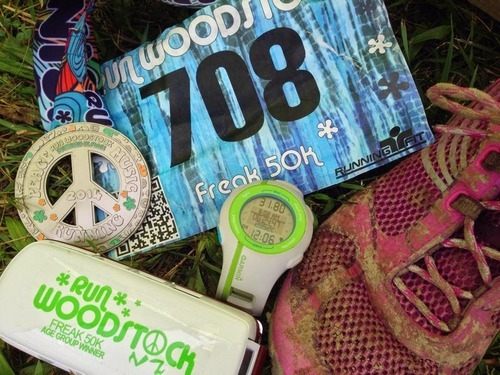 Run Woodstock doesn't have to be your typical race experience (expo, run, nom a banana and go home). If you choose, you can move in Friday - pitch a tent (or set up your camper) - and call it home for the entire weekend. With food trucks, showers, friends and beer available, there's really no reason to leave camp except for your run through the woods of beautiful, early fall Michigan. If this is what an Ultramarathon feels like, count me in for more. I can totally see how this could become a lifestyle. The Expo is non-existent. Super easy check-in at a shelter house to get your bib, t-shirt and weekend wristband and BAM, you're all set to go. I know many people are apprehensive about running trails for fear of getting lost. The trails for Run Woodstock are extremely well marked, including retro-reflective tips on the trail flags and printed signs where different distances merge and separate. The trails aren't technical. There are some hills, but not as tough as you'd think (it's Michigan, after all). The aid stations are plentiful and the volunteers amazing. 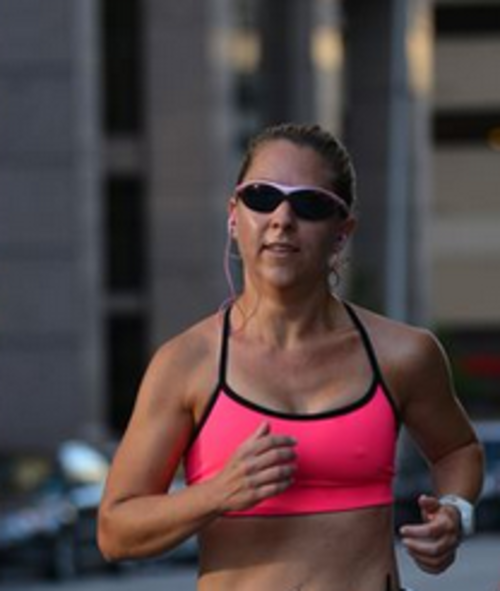 Heck, you're likely to see runners lending a hand when they aren't racing - just the way it should be. All of the entries get you access to Friday and Saturday nights untimed 5k and Sunday's 5-miler, as well as Hippy Yoga on Saturday afternoon and tons of other activities. They really do embrace the theme: Peace, Love and Running. If you're eyeing your first trail race or Ultra, this is a great one. Within minutes of finishing our ultras, Hubs and I declared that we'll be back every year we possibly can. It's SO worth the 6 hour drive.